Please your taste buds on the flavoursome Fruit Frenzy Slot, powered by Pariplay! Consisting of a 6x6 grid, you will absolutely relish the taste of this satiny online machine. What’s more? The game is packed with colourful and delicious symbols. Its state of the art graphics will have you oohing while its magnificent animations will have you aahing from the comfort of your seat. 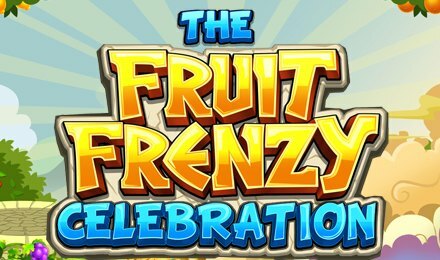 Get a kick out of Fruit Frenzy Slot and have some spinning frenzy! The very first step is to hop over at Vegas Spins and to log onto your account! Once you load up Fruit Frenzy Slot, you will have to adjust the desired stake amount. The objective of the game is to match the fruits in order to fill the bars and turn them to wine! Corresponding fruits fill the equivalent bar on top of the game board. You will notice that each bar has a different multiplier. Once the bar fills up entirely, the fruits will be transformed into wine and the multiplier win amount is granted! Bet Levels: There are no bet levels available on Fruit Frenzy Slot. Amount of Paylines Selection: No amount of lines are also available. Coin Values: The betting options range from 1.00 to 250.00. Head to the Choose Bet field to pick the correct amount! Matching 5 fruits on the reels could unlock a random boost. This may include a Charmed Apple or a Mighty Zeus powerup. The Charmed Apple can be matched with any fruit. On the other hand, the Mighty Zeus power up automatically triggers once it's released. It clears a whole horizontal or vertical line. During the gameplay, Bonus Coins or Free Game Symbols may fall in from the top of the board or spawn from corresponding 5 fruits. You must try to match 3 of these symbols to get Bonus Coins or Free Games! You can earn prodigious prizes by filling the fruit multiplier bars! It is good to note that different fruits may award different multiplier amounts! To unlock the Jackpot Game, you must score 10,000 points. While playing the jackpot game, you must tap on 6 doors. Possible winning matches include; Match 3 Jackpot Symbols to win massive, Match 3 Free Game symbols to win free games or Match 3 Bonus Coin Symbols to win cash! Ready to have a transcendent fruity gaming activity?